USGBC-Missouri Gateway Chapter is accepting proposals for educational programs to be offered in 2017. USGBC-MGC strives to offer a diverse selection of educational programs to educate our members and community on current green building principles and practices and to expand the opportunities for LEED Professionals to gain continuing education hours. We are particularly seeking in-depth workshops – extended consideration of topics to build upon green building professionals’ existing knowledge. Call for Proposals Issued July 1, 2016. Proposals due by Tuesday, August 30, 2016 at 11:59 PM CST. Selected Speakers notified by November 30, 2016. Think outside of the box, and support USGBC-Missouri Gateway Chapter’s efforts to offer a diverse selection of programs to educate our members and community on current green building principles and practices! CLICK HERE TO SUBMIT YOUR PROPOSAL TO USGBC-MGC! The nation’s largest smart growth and sustainability event will be in St. Louis next year and they are seeking YOUR expertises for sessions. The conference will be February 2 – 4, 2017 at the Marriott St. Louis Hotel. The theme for the 2017 conference is “Practical Tools and Innovative Strategies for Creating Great Communities,” with an emphasis on implementation tools and strategies, and new technologies that will help communities now. 1200 smart growth leaders from across the country attend this conference. 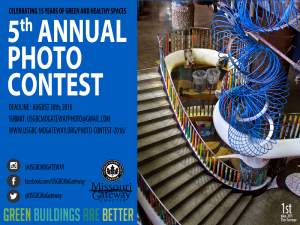 5th Annual Photo Contest Deadline Extended! 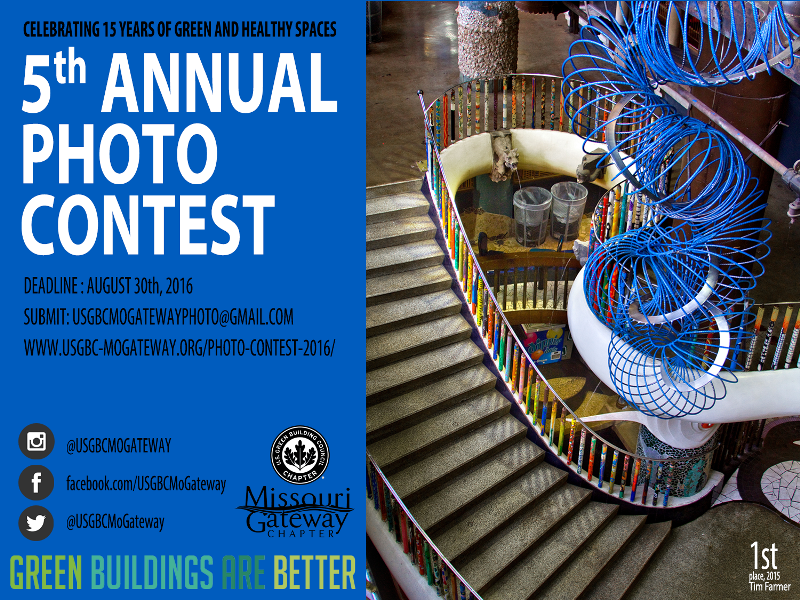 USGBC-Missouri Gateway Chapter’s Marketing Committee is pleased to announce our fifth annual photo contest! The contest is open to all residents of the Missouri Gateway Chapter territory (see territory map). The contest deadline has been extended until September 15! Winners will be announced on October 18 at our monthly program. Congrats to 2011 Growing Green Award Nominees!